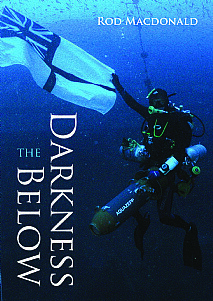 From the best-selling author of four classic UK diving books, comes The Darkness Below - a collection of absorbing adventures gained from a lifetime in diving. As one of the UK's leading Technical Divers, Rod takes the reader on a spellbinding and gripping journey, from first beginnings as a novice scuba diver. Told in intimate detail with a beguiling sense of self-deprecating humour, he recounts epic dives on some of the most fabulous shipwrecks around the world. Terrifying first explorations of virgin shipwrecks far offshore, lost in time and enshrouded in darkness in the silent depths, cram the pages. A daring expedition into the heart of the feared Corryvreckan whirlpool, the third largest in the world, an open sea encounter with Orca killer whales and an agonizing attack of the bends keep the reader engrossed. The palpable gloom, despair and human tragedy of the wrecks is never far away - the cold and darkness of the depths almost resonating with the cries of those who have perished. The fear of entrapment inside a wreck is grippingly described and becomes almost claustrophobic to the reader unfamiliar with the perils of wreck penetration, when snagged nets sometimes billow unseen above the unwary diver. However, there are rewards when survivors from wrecks are keen to speak to someone who has seen and touched their ship that had been lost long ago. This is an unmissable book for all divers and anyone interested in maritime history. This is an unmissable book for all divers and anyone interested in maritime history.